European corn borer (ECB) moth catches in black light traps have dropped to very low levels again. The second flight is likely to be very erratic, with specific locations getting low numbers of moths while other regional traps catch none. There will be no map in this edition. 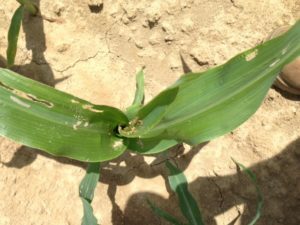 Second generation feeding is often obscured by fall armyworm (FAW) feeding. Once plants hit full tassel, any ECB larvae present will move downward on the stalk and re-enter the plant near the area where ears are forming. This can result in direct injury to the ear. Growers should consider an insecticide application at the full tassel stage to target ECB larvae as they migrate downward. This application can eliminate larvae that have escaped any earlier insecticide applications. 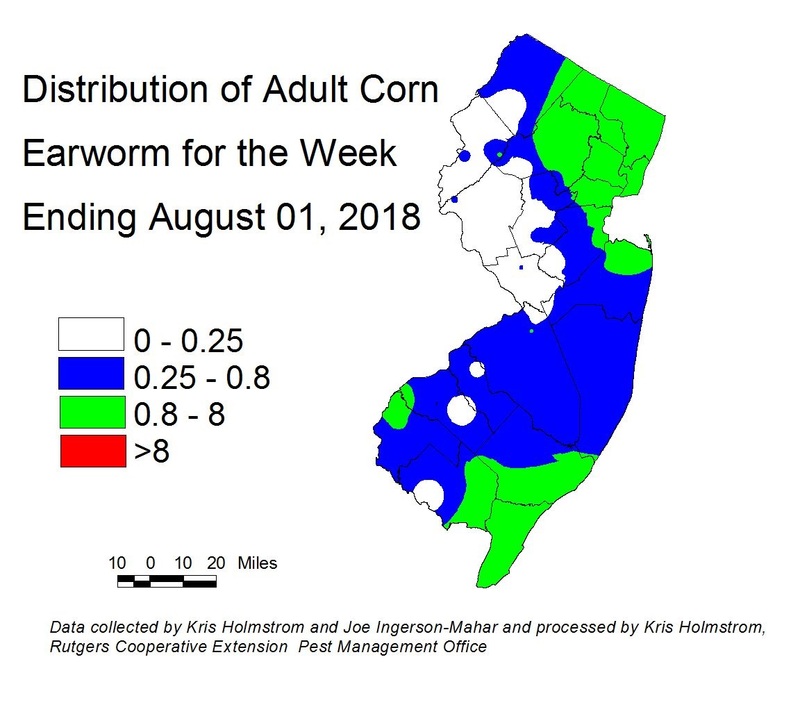 The air flow that we continue to experience is bring waves of corn earworm (CEW) moths to New Jersey. While numbers have been somewhat inconsistent, there have been significant catches in all regions of the state. The CEW pheromone trap network in the southern counties is showing a similar increases (see CEW blacklight map at left, and pheromone trap map at lower right). There are many fewer pheromone traps than blacklight traps. This results in much broader colored patches on the pheromone maps. The blue area on the blacklight map indicates an approximate 4-5 day silk spray schedule, while green would be 3 days. On the pheromone map, the green area corresponds to a 3-5 day schedule depending on location. This week, growers on the eastern half of NJ down through Cape May should adhere to the tighter schedule within that range. Trap catches from Virginia are rising, while Delaware catches are generally similar or lower than New Jersey’s. The moths trapped this week in NJ likely do not represent a major migratory event like the ones we typically get in mid August and later. Rather, persistent southerly flow is allowing a steady influx of mid-summer individuals to our area. Without a strong cold front and change of wind direction, expect this situation to continue. Growers of Attribute I and Performance Series sweet corn (expressing B.t. traits) should consider adhering to silk spray schedules prescribed for non B.t. sweet corn. At this time, Attribute II varieties are not known to support CEW larvae. *These recommendations are based on regional catches. Adhere to tighter spray schedules if indicated by local trap catches. 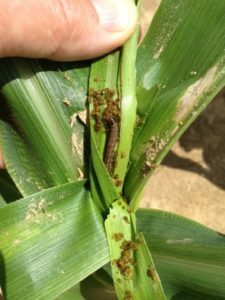 Fall armyworm (FAW) infestations continue to be light and spotty, even in coastal regions. 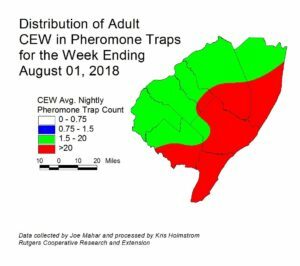 In addition, southern NJ pheromone trap catches have been very low. This is consistent with reports from states to our south. However, it is a good idea to continue scouting regularly for this pest. Look for significant injury in whorls, with all damage leading directly into the center of the plant (see photo at left). FAW larvae consume lots of tissue, and grow rapidly (see photo at right). Be sure to check seedling stage plantings as well, as FAW will attach even small plants. Consider treating if plants infested with FAW alone, or in combination with ECB exceed 12%. FAW is resistant to synthetic pyrethroid insecticides. Effective materials include those in IRAC groups 5 (Radiant, Entrust (OMRI approved)), and 28 (Coragen, Exirel). So far only one infested field has been confirmed. No other weevils have been trapped outside of the Hammonton area. 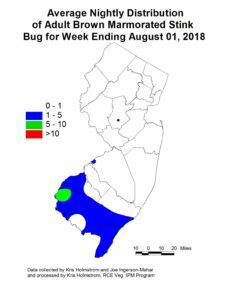 Pheromone trap catches of BAW in southern NJ remain fairly high near Woodstown and moderate near Jones Island, but low elsewhere. At this time, there are no known field infestations. 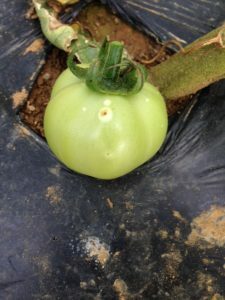 Native brown stinkbugs are active in tomatoes now. 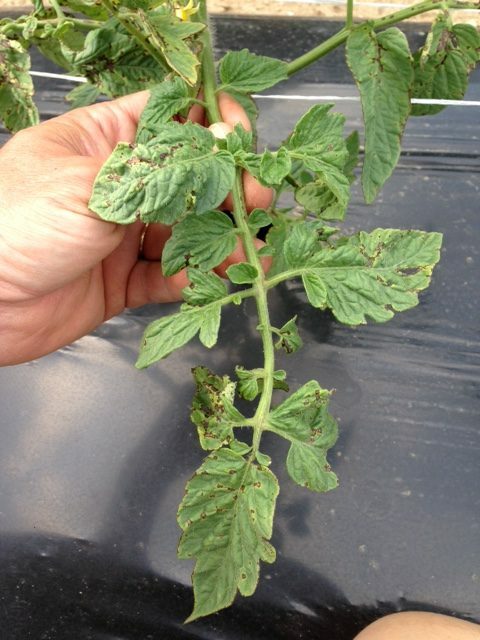 Stinkbug damage can be an economic problem for our field tomato plantings through September. Stink bug feeding results in pale blotches on green fruit, that turn yellow as the fruit ripen to red (see photo at right). Picking crews often notice this damage first, as they see the greatest volume of overall fruit. 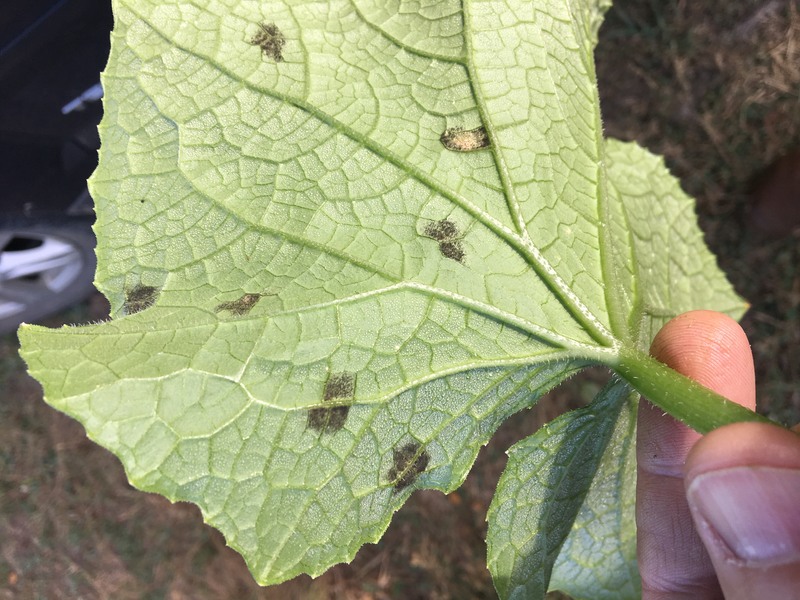 If this damage is increasing, and/or adults, nymphs or egg masses are occurring in scouting samples, consider treating. See the tomato section of the 2018 Commercial Vegetable Recommendations Guide for appropriate materials. 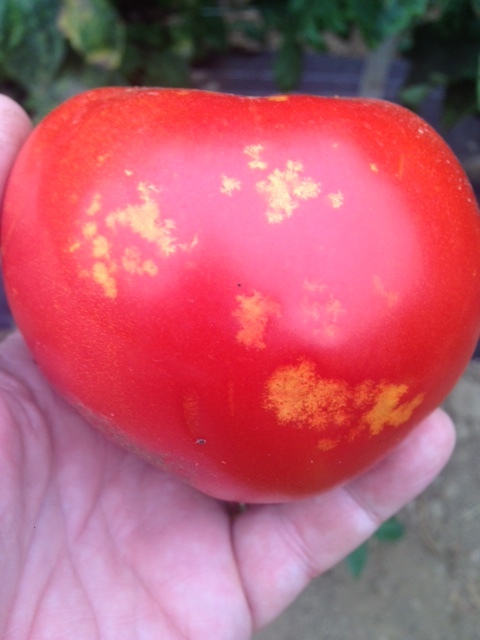 With very warm, wet weather, foliar diseases of tomatoes are increasing. Be sure to monitor the tomato/potato disease forecasts generated from the RAREC station. This information appears weekly via the Plant and Pest Advisory and is useful for calculating spray schedules necessary for early blight. Bacterial infections are particularly common now. Bacterial leaf spot (BLS) (see photo at left) is showing up to some degree in most scouted plantings in the northern counties, and bacterial canker is present in a number of locations as well. BLS causes small, very dark lesions on all ages of foliage. 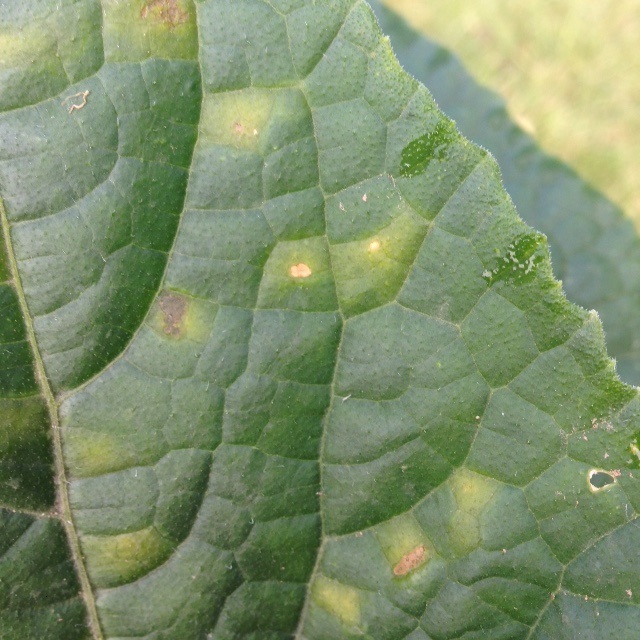 When these lesions occur on juvenile tissue, the leaves often become distorted as they expand and mature. Bacterial canker can cause a marginal necrosis, typically on older foliage. Pale streaks form on petioles and a characteristic fruit lesion called bird’s eye spot (see photo at right), forms on the fruit. Labeled products are found in the tomato section of the 2018 Commercial Vegetable Recommendations Guide. BMSB catches in black light traps are generally low, but have risen somewhat in southwestern NJ. The most consistent catches occurred in western Salem county. Although this pest has not had serious impact on vegetable crops like peppers in recent years, it is still a significant pest of tree fruits. As per Dr. Wyenand’t cucurbit downy mildew (CDM) alert of 8/01/18, all growers should be applying appropriate DM fungicides on all cucurbit plantings now. CDM has been found on pumpkins and butternut squash in Cumberland County and on cucumbers in Hunterdon, Salem and Warren counties. CDM causes yellow “panels” to develop on the upper leaf surface (see photo at left) with dark sporulation forming on the lower leaf surface (see photo at right). CDM can defoliate fields in a matter of several days during wet conditions such as we are currently enduring. At the present time (8/01/18), cucumbers in the sentinel plot at Snyder Farm are infected. Our present weather pattern has New Jersey cucurbit crops under constant threat of CDM infection from spore sources locally and from more southern sources. For detailed CDM forecasts, see the following website: http://cdm.ipmpipe.org/ All growers are encouraged to check this website at least once a week. NJ is considered to be at moderate-to-high risk for spread from existing sites through Thursday of this week. A basil sentinel plot at Snyder Farm in Hunterdon County, now in full flower, has not yet been infected with basil downy mildew. Basil downy mildew is present in southern NJ. Torac (tolfenpyrad) is an IRAC group 21A insecticide that is now labeled for fruiting vegetables to help control thrips, among other insects. Earlier this year, the EPA approved the label expansion to include fruiting vegetables. 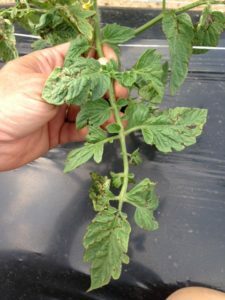 Thrips control continues to be a persistent problem, especially with favorable conditions (hot and dry) that we had experienced prior to this recent bout of wet weather. Torac will add a different mode of action that may be alternated with other chemistries to make thrips control easier and help prevent resistance. It is noteworthy that IRAC 21A materials include the miticide Portal. Torac is also labeled for control of pepper weevil on peppers and eggplant. This adds another material that may help manage this important pest.